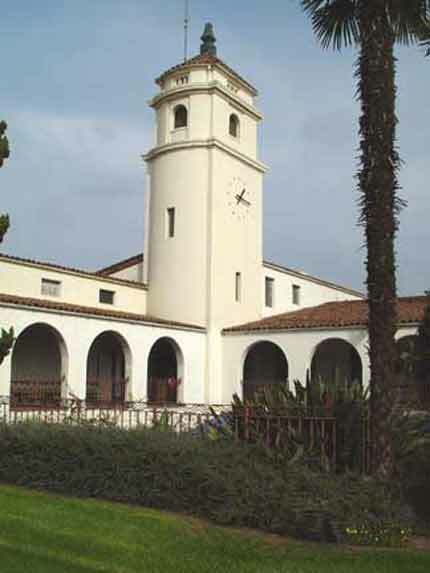 An exceptionally fine example of the Spanish Colonial Revival style applied to civic architecture, the former Fullerton City Hall, now the Police Station, was one of a number of Work Projects Administration (WPA) buildings completed in Fullerton in the 1930s and 1940s. The building was originally designed to house all city government offices and departments, including a jail, city council chambers, and a courtroom. 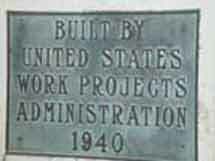 At the time, Fullerton residents believed the City Hall would contain all the services the city would ever need. Constructed in 1939-42 of poured concrete, the City Hall is a graceful, one and one-half story building with a basement that has an L-shaped plan opening toward the southwest. An unusual three-story clock tower is positioned at the central corner. The building's balanced design, enclosing a sunken patio on two sides, is complemented by fine detail work, including art deco tilework and decorative wrought ironwork. One of the premier tile companies of the era—Gladding, McBean and Company—produced all of the colorful and noteworthy ceramic and terra cotta tiles that decorate both the interior and exterior of the building. The City Hall was designed by noted architect G(eorge) Stanley Wilson, a British immigrant who arrived with his parents and five siblings in Riverside in 1896. By the mid-1930s, Wilson had established himself as one of the premier exponents of Spanish Colonial Revival architecture, and he was a natural choice as an architect for a city that favored Spanish building designs. Wilson was at his artistic peak in the 1920s and 1930s, and the City Hall reflects the grace, harmony, and balance that his buildings had during this period. Wilson designed many buildings around Southern California, but is best known for his various projects from 1909 to 1944 for Riverside's famed Mission Inn. In 1909, Wilson began to work closely with the Inn's flamboyant owner Frank A. Miller (1857-1935) on small additions and changes to the building, which eventually became the largest Mission Revival building in California. Working under Pasadena architect Myron Hunt, Wilson was superintendent of construction on the Spanish wing, when the Spanish dining room, large kitchen, Spanish Art Gallery and its rooms above were constructed in 1913 and 1914. In 1929, Wilson designed the Inn's major addition, completed in 1931—the five-story structure on the northwest corner of the block, facing Sixth Street and Main Street. The wing included the International Rotunda, the Saint Francis Chapel, the Saint Francis Atrio, and the Galeria. The City Hall houses a valuable treasure: a series of murals depicting Southern California history, which were painted by Helen Lundeberg (1908-1999), one of the leading female artists of the American west. Wilson commissioned Lundeberg in 1941 to paint a three-panel mural for what was then the city council chambers. Titled "The History of Southern California," the panorama of panels depicts early California history from the landing of Juan Rodriguez Cabrillo at San Diego Bay in 1542 to the early days of the movie industry in Hollywood. In 1992-93, the murals, which had been painted over and obscured by a false ceiling when the Fullerton Police Department took over the building, were completely restored by ConservArt Associates at a cost of $80,000.